Stained Glass Lamp Cake that Lights Up! I made 6 white wedding cakes. I made butter cream icing and marshmallow fondant for the roses. After melting the marshmallows with a few tsp. of water I added 6-8 cups of powdered sugar and mixed until it started forming a solid ball. I covered my fondant sheet with butter so it wouldn’t stick then continued working the marshmallow/sugar mixture while adding more powdered sugar until it got to the consistency I wanted for the roses to hold their shape. You can add any color to the mixture at this stage. I then used a flat 5 petal rose cutter to cut the petals and used a ball fondant tool to make the petals look more real. I took a small ball of fondant, put it on a florist wire then wrapped alternating petals around the ball using 3-5 rose petals to form the rose. For the butter cream I whipped 4 cups of sweet cream butter, 20-24 cups of powdered sugar, 1-2 cups French Vanilla coffee creamer together. For assembly of the cakes I used 2 cakes per tier with a butter cream filling between the cakes. Then covered with butter cream and smoothed the icing as flat as possible by dipping your spatula or knife in water to give it a smooth glossy finish. I used 3-4 wooden dowels in each cake to hold the weight of the other tiers. I piped the black stitching onto the cakes using a pastry bag with a #7 tip. 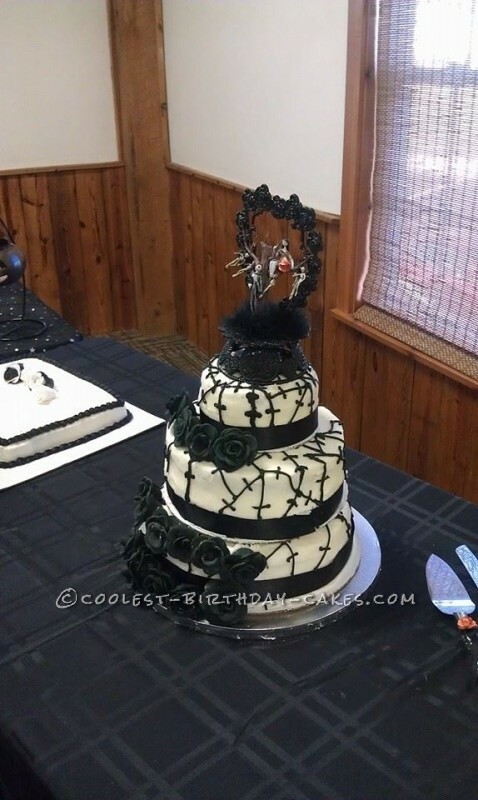 After repeating this process for all cakes I stacked the cakes on one another and placed the florist wires with roses on the cake while using the wires and tooth picks to secure the roses. 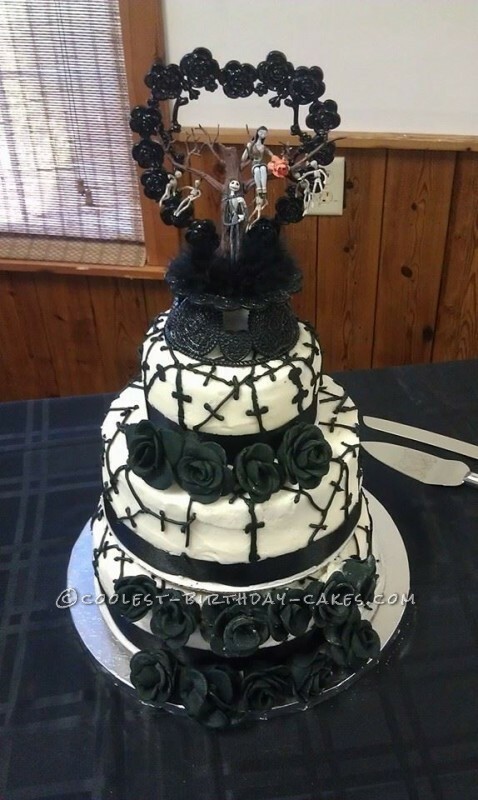 Prior to this cake I had never made fondant roses and was surprised by how easy it really was. I am a self taught cake decorator who learns by doing and watching YouTube videos. I made this cake for friend whose son was getting married. It was the first wedding cake I’ve ever made…It was a very stressful experience because it was a WEDDING cake!!! But I can honestly say I was very proud of the way it turned out and everyone was very impressed with it! The bride and groom absolutely loved it!!! 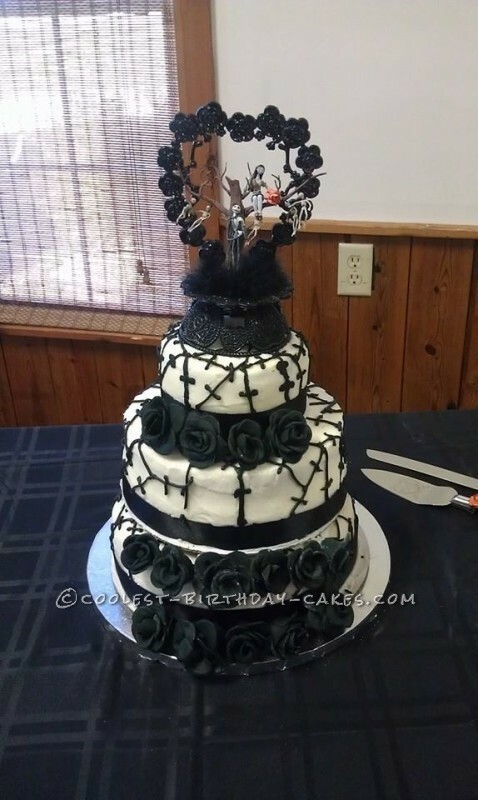 I’m sorry if I didn’t explain in enough detail I am still very new at all this cake business but I LOVE MAKING CAKES and getting to make people smile while doing it.